The LDC actively pursues research funding through a coordinated Centre-led and supported approach. The LDC has contributed to a range of national and EU research projects, addressing adult literacy teaching methodologies, curriculum development, policy and professional development. The LDC is currently involved in a small number of projects, details of which may be found in the sections below. Taking a pro-active approach to generating Masters by Research proposals that address the theme of Barriers to Learning for Practitioners and their Learners, by desk research on the policies and literature including the need for research on academic literacies. HEA Innovation & Transformation Call: Engaging with recognition of prior learning for lifelong learning A research project in collaboration with the TSSG. Erasmus +Research project: On the area of upskilling pathways to adult education. A number of EU partners involved including WIT & National Adult Literacy Agency (NALA). We are currently working together on research gathering learner perspectives on curriculum development in adult and further education titled ‘Fitting into FET: Learner perspectives on the impact of curriculum development at NFQ Levels 1-3’. Research is currently underway with plans to disseminate report late 2019/early 2020. The Wealth Model in Adult Literacy: transformative learning in action’, a research partnership WIT/NALA. Launched 2018. 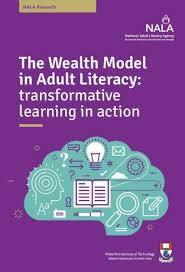 The research that led to the Wealth Model of Adult Literacy, launched in 2018 comes from literacy tutors speaking about their practice, and highlights the distinct elements that result in transformational learning. The Wealth Model and the Meeting the Challenges research reports follow on from case study reports relating to good practice in teaching reading and numeracy. They provide good ideas for new tutors, and validate good practice for more experienced tutors. 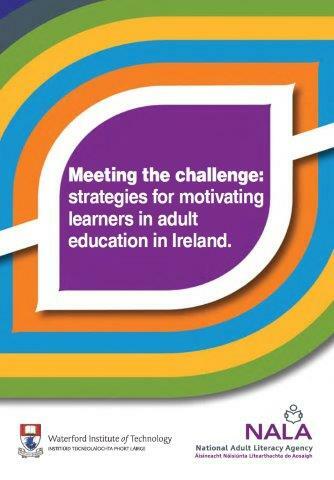 This research report, entitled: "Meeting the Challenge: Strategies for Motivating Learners in Adult Education in Ireland" was launched in January 2017. It examines current teaching and learning practice in adult literacy provision in the context of the changing profiles of learners. The research captures motivational teaching practices and presents them in a way other tutors may find useful when seeking to build the motivation levels of learners. A pdf copy may be found here by clicking on the image.